Nickel Plate Road Steam Locomotive No. 587 is a rare early 20th-century light Mikado steam locomotive developed by the United States Railroad Administration (USRA) during World War I rearmament. The locomotive is one of only a few of its class or type left in the United States. The light Mikado locomotive design was so successful that it was used in freight and passenger service and larger more powerful locomotives were based on its design during the last thirty years of steam locomotive construction in the United States. The Mikado design was effective because of the development and application of the two-wheel trailing truck. The truck made it possible to construct larger fireboxes and longer boilers that allowed for the enhancement of steaming capacity and power output. The United States Railroad Administration assumed control of the American rail system under Congressional authority to prepare the United States for war. Baldwin Locomotive Works built No. 587 in September 1918. The specifications for light Mikado class locomotives came from the USRA, which assigned No. 587 to the Lake Erie & Western Railroad, later known as the Nickel Plate. The Mikado design has a 2-8-2 configuration of wheels; 2 pilot, 8 driving, 2 trailing, which was first used for an order of locomotives for the Japanese National Railway in the 1890s. The USRA’s light Mikado was one of the first dual purpose modern steam locomotive designs, an engine that could be effectively used on heavy coal trains, fast merchandise freight trains, and passenger trains. Nickel Plate No. 587 hauled both freight and passenger trains. During its 37 years of use, it very often was based out of Frankfort, Indiana, serving a Chicago – Buffalo route, and occasionally the locomotive ran an Indianapolis – Michigan City line. 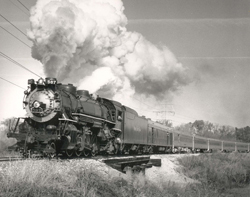 The locomotive’s most distinguished service came in October of 1952, when it pulled the campaign train of then presidential candidate Richard M. Nixon from Lafayette to Frankfort, Indiana. Nickel Plate Road Steam Locomotive No. 587 is currently under restoration and is housed at Forest Park, Noblesville, Indiana, a 45 minute drive from Indianapolis. The Indiana Transportation Museum is open April through October on Saturdays and Sundays. Consult Indiana Transportation Museum website for more information. When in service, the locomotive’s home is often the Beech Grove Rail Yards in Indianapolis.